It is unusual for two biographies on the same subject to be released within a month of each other, but then again Kick Kennedy is an unusual subject. 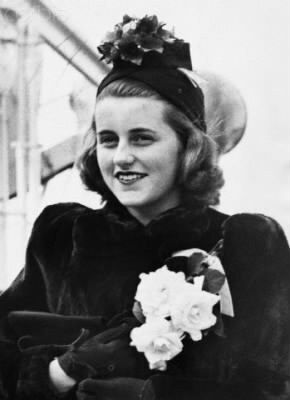 The second-born daughter of Irish-American parents, Joseph and Rose Kennedy, she is forever associated with her political family, most especially the American president John F. Kennedy. 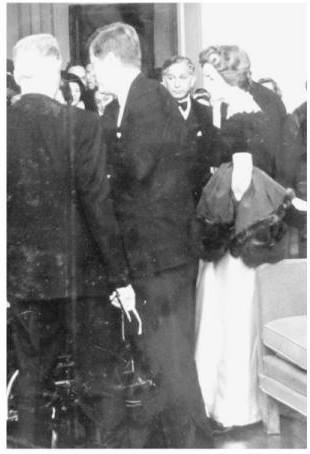 All of the Kennedy children had star quality, Lady Redesdale (Muv) had once remarked that JFK would one day become president of the United States. And so their charisma hypnotised London high society in the late 1930s, when Joseph Kennedy was posted there as the American Ambassador to the United Kingdom. The older girls were presented at Court, and Kick began to move in the exclusive circles of the aristocracy. She was an anomaly for her time: outspoken, forward-thinking, and silly. She could laugh at herself and openly joke with the gentry at a time when English girls, who adhered to formality, could not. Surprisingly, this won her a great deal of admiration and her greatest friends became Sarah Norton (daughter of the beautiful Jean Norton, Lord Beaverbrook’s mistress), Billy and Andrew Cavendish (sons of the Duke of Devonshire), and, of course, Debo Mitford. Barbara Leaming’s book, Kick Kennedy: The Charmed Life and Tragic Death of the Favorite Kennedy Daughter, explores the connection Kick shared with Andrew and Debo in great detail. 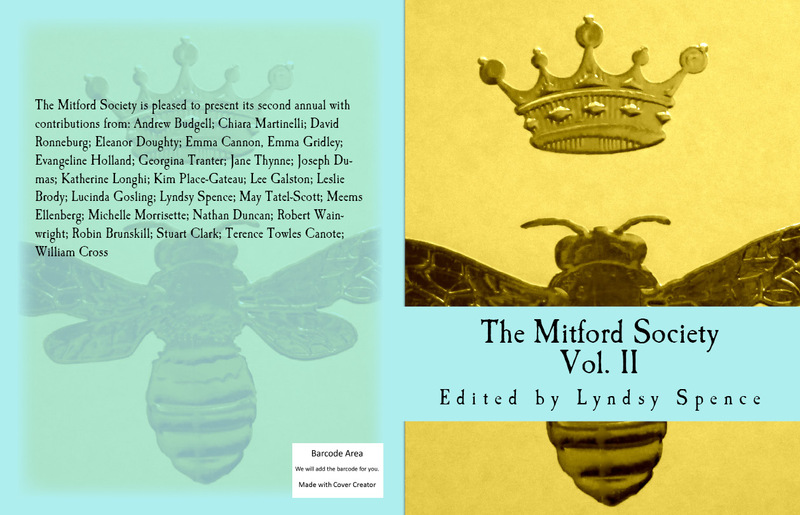 The beginning of her book was a lovely surprise, with the elderly Andrew confiding his remembrances of Kick. And so her story begins and maintains its momentum as a portrait of a girl who moved at the centre of the British aristocracy. Through her research of Kick, she bypasses the Kennedy lore (only sprinkling Kennedyisms where necessary) to focus on the themes which shaped Kick’s life and her destiny. The complex love story between Kick and Billy Cavendish dominates the plot, but the subplot of Andrew and Debo gives this story an interesting parallel. Here was a woman who had the world at her feet until WW2 destroyed her future and her happiness, as it did for so many families. With their long, drawn-out courtship happening on both sides of the Atlantic – often one-sided, and their battle to marry, it is bittersweet that they were destined only to be husband and wife for a short period. Billy, as the eldest son, was expected to inherit the Dukedom of Devonshire, and Kick was to be his Duchess (there are some interesting points on Georgiana, the Duchess of Devonshire), but after his death she was deposed by Debo. Although both women were best friends, it was interesting to read about the hidden feelings Kick had about the new path her life had taken, and the (for lack of a better word) guilt Debo harboured for unintentionally usurping Kick. Kick was killed in a plane crash at the age of twenty-eight, and although she had been widowed from Billy and had fallen in love with another man, the Devonshires continued to hold her close their hearts. 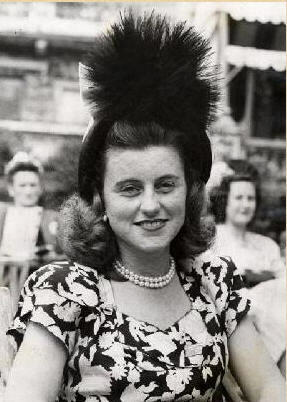 Not only is this a story of an extraordinary young woman who took life by the scruff of the neck, it is an example of fate and how Debo became the Duchess of Devonshire. Perhaps it was Kick who paved the way and set the example of mixing informality with the pomp and grandeur of that lifestyle, which Andrew and Debo were renowned for. Thank you to Barbara Leaming for sending me a signed copy of her book. Her narrative is informal and yet it draws one in, as though they, too, were sitting next to Andrew as he remembered his late sister-in-law. The beginning and ending were entirely original, given the acres of print written about Chatsworth and the Devonshires. Part Two of my Kick Kennedy post will look at Paula Byrne’s biography, Kick: The True Story of Kick Kennedy, JFK’s Forgotten Sister and Heir to Chatsworth (released 19 May 2016). Both biographies are completely different and are extremely good. So please buy and read both of them! If you are very, very lucky, someone comes into your life out of nowhere and changes everything. Debo Devonshire did that for me. I certainly didn’t deserve her—no one could deserve someone quite that wonderful. Actually it was Andrew Devonshire who first invited me to Chatsworth and it was Andrew who gave me the first incredible gifts I was to receive—and the greatest of those gifts was Debo. I shall always remember Debo that first night: that night she was performing for Andrew as well as for me. Sixty years into their marriage, Andrew was a rapt audience. It was not difficult to see why—though to me, during that first dinner at least, Debo was very scary. That night, it was Andrew who was the gentle one, Debo the one with whom I was sure I could never dare relax. But it changed—not least because that first night I realized that one of Debo’s greatest qualities was that she was interested in everything, really everything. She wanted details; she wanted to know how things worked; she wanted to know EXACTLY what you meant when you said something—and not an iota of that interest was faked. And she would ask questions that no one else would dare to ask. Alone together upstairs in her sitting room late that first night, she made me pull up my trouser leg to see if I had the “great legs all American girls have.” I didn’t, but I did pull up the trousers—actually SHE pulled up the trouser leg. It was an extraordinary night—not least because I fell in love with both Andrew and Debo that night—and completely unexpectedly the seeds of a friendship were planted. I’m so glad that I had the luck to see Debo with Andrew for no matter how much I was later to hear about the two of them from Debo herself and also from their family and friends, I would not have understood the complexity of that relationship had I not actually watched him watch her and her watch him. I was in England then to research my biography of President John F. Kennedy. My husband and I had a flat on Eaton Place not far from Debo’s Chatsworth Shop on Elizabeth Street. The little shop was a very special place—pure Debo—and she loved it and was deeply involved with it. My husband used to buy all of his lunches there and I still giggle thinking about how I would come home to find David on the phone with Debo in intense discussion of the merits of her soups and especially detailed reports about the prices of an item she was selling versus the price of a similar item in a supermarket on King’s Road. When the Chatsworth Shop closed later, I had an urgent phone call from her cousin Jean, warning me that Debo was so upset that I must be careful not even to mention the closing for a time. After Andrew died, by which time Debo and I had become friends—initially, I believe, because Andrew made sure it happened—and by which time we had other deep friendships in common, Debo did not draw back, but rather expanded the wings of her friendship. She and Andrew had been indispensable to my research for my biography of President John F. Kennedy and to my understanding of the man and the world in which JFK lived. But for the book I wrote next, about Winston Churchill, Debo, now alone, went much further. First she listened to what I hoped to do with Churchill—and then she took charge. Debo never had to be asked to help. She just offered—no rather, she ACTED. Before I knew it, she had made up lists of people I must talk to about Churchill, including her cousin Mary Soames—and then moved on to make sure they talked to me—and then made sure that I asked the right questions. She wrote letters; she made calls; she went over ideas with me. It was endless and she was incredible. Debo loved to give advice—especially about how to do things cheaply. I still laugh thinking about her voice on the phone the day I moved into the flat I’d rented in Mayfair to do Churchill research. Our flat was not far from the Beau Brummell house she still owned, and she was full of detailed instructions about where to go in Shepherd Market—but better, still, about what to do cheaply. Debo loved the idea of doing things cheaply. “Keep your hands in your pockets!”, as she put it. When I went up to stay with Debo at Edensor, it was strange at first to think that Andrew was gone—or rather, that he was next door, as she reminded me—in St Peter’s churchyard. But she was so funny, so over the top about everything as usual. So welcoming. There was, I think, more emotion now that Andrew was gone—more sense of time passing. And always, more reminders not to waste a minute—to grab everything you can, while you can. I can still hear her as we sat on the old-fashioned swing on the lawn in front of the vicarage talking about Andrew; talking about “the cousinhood”; talking about people that both of us knew—people she had somehow miraculously brought into my life—who were now gone. As she talked about all that she missed, suddenly the swing started moving faster because Debo also wanted to talk about the future. What she wanted to do next—and a reminder that I must not just be thinking about what I was doing now, but what came NEXT. Debo and Andrew are also very much there in my new book on Jackie Kennedy [Jacqueline Bouvier Kennedy Onassis: The Untold Story]—all sorts of things they told me about the aftermath of the assassination—as well as about what was going on during the presidency. And I am going to return in detail to that world which they opened to me with unimaginable generosity in the book I am writing next. So much of what they shared with me has vanished now—but my mind is filled with images of that vanished world—a world that strangely enough has become part of my own future. I can’t bear to think that there will never be another letter from Debo turning up in the post, that the phone will never ring again with her voice on the other end inviting me to stay with her in Edensor, that there will be no more long talks about the members of “The Set,” and, of course, that there will be no more books from her to treasure forever. Everything about Debo had to do with life and what’s next, and for that reason it is just impossible to imagine she is not out there plotting some future project. 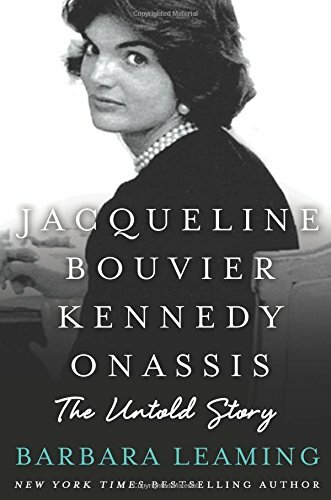 Barbara Leaming’s book Jacqueline Bouvier Kennedy Onassis: The Untold Story will be published in the UK on January 1st 2015. It is already available in the US.